NorthStar Battery is a world leader in battery technology. Their premium pure lead AGM batteries is the prime choice for Daimler trucks in both North America and in Europe. 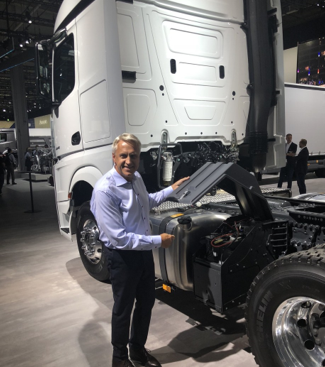 NorthStar started delivering batteries to Daimler in North Americain 2016 and subsequently initiated deliveries to Europe in 2018 for the new Mercedes-Benz Actros, Antos and Arocs models. As a further extension to the collaboration, Daimler has together with NorthStar created a tailored version of NorthStar ACE®, called AGM Truck Test, as an AGM battery analytics tool for Daimler’s service centers. NorthStar ACE® is the award-winning battery management system that allows users to wirelessly retrieve real-time and historical performance data. The system was launched for the Telecom segment in 2017 where it has gained approval at several large operators globally. It was later introduced to the Transportation segment in 2018.